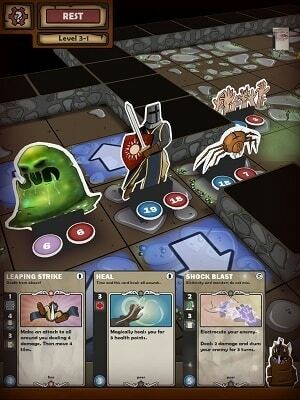 Combining rogue like elements, card collecting and turn based role playing is Card Dungeon, a uniquely entertaining experience for your mobile device. With a crusader under your control, thousands of cards at your disposal and hordes of enemies in the dungeon before you Card Dungeon will keep you engrossed for hours and hours. Mixing the card and board game genre into one is never an easy feat but Card Dungeon manages to do so while keeping the core mechanics simple but still offering a level of depth that still gives it great value at its price point. At the start of each game players can select a two passive trait cards to help in the adventure ahead. One of these has a positive effect (such as healing you randomly) and the other has a negative effect (such as only being able to purchase 1 shop item). While you’ll start off with only two traits you’ll eventually end up with about a dungeon as you collect knowledge gems throughout the dungeon. In addition to your trait cards players will get dealt three cards for each new adventure which can range from healing to magic, attacks, blocks and summoning. For example players may get a card that allows them to cast a shock blast or swing their sword with a devastating strike. Using these cards players will traverse the various game chapters exploring rooms and defeating evil creatures. As a turn based game you can only perform one action for each turn, be it moving, searching a chest or attacking an enemy within range. Both chests and slain enemies will allow you to find new cards to replace your damaged ones along with potions to recover any lost health or mana. From time to time players will also come across items to improve their monster slaying stats. 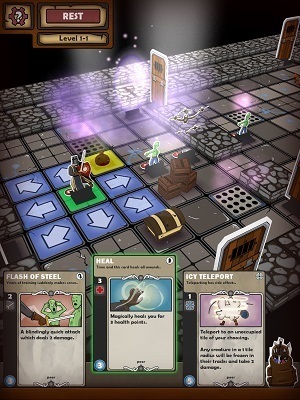 Overall Card Dungeon is a solid addition to the growing rogue like genre on mobile devices, it’s a highly addicting mix of genres that ticks all the right boxes. Unique artwork for every card. Every card has limited uses. Rogue like gameplay delivers a real challenge. Positive and negative traits system creates interesting decisions. For iOS and Android devices.